So I'm almost there. But still can't get the bloody mic to work. My car a 2015 Passat doesn't have the bt under the seat it has it in the arm rest instead. Tried following Patrick's post replicating what he did under the seat but to no avail. Just can't figure out if it doesn't go to the head unit and doesn't go to the bt. Where the hell does it go! 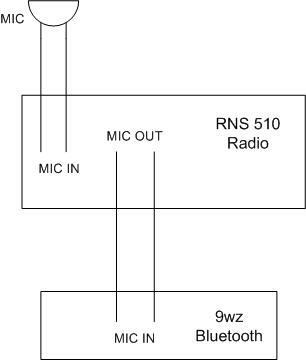 if you had the navigation (RNS510) , the mic is directly connect on the rear of the radio. (Green connector 12 pin). In my case, the Android Auto media volume vs all other volumes (radio, BT audio, whatever...) is low. I.e. I always have to double the volume setting when I switch to Android Auto media, then turn it back down again if I switch back to FM radio, in order to get what sounds like consistent volume to my ears. I'm not sure whether the Android Auto media volume is low, or the rest of the volumes are high. My guess is that the rest of the volumes are high - even at only 25% volume, the radio volume is extremely loud. I know there is a Quiet/Medium/Loud setting in the UI for BT audio (or Low/Medium/High, can't remember). I have to set it to High to be close to the radio volume, and even then the radio volume level is still noticeably louder. Does anyone know if there is a way to change volume scales or do some other adjustment in VCDS or otherwise to help make the volume levels between different sources more consistent? I also do not know of a way to raise Android Auto media volume on the phone side. If someone knows of such a thing, that would be an effective (but still not optimal) solution too. Did you ever have any luck getting it to work ? The CECM & CCM were combined, not Gateway. The dealerships will never get an MIB2 PQ units working due to the VW servers kicking back cause the head units were not available in PQ cars before 2016. FWIW, since this was my original post... I traded my 2012 Golf R for a 2019 this weekend, so my MIB2PQ is for sale. In mint condition, and with the original harness and adapters. $1250 OBO. Hit me up! I really wish I had the cash for that right now.